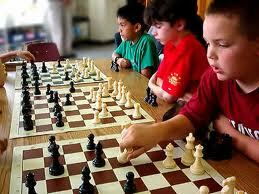 Benefits of teaching chess to children. The game of chess is a real test to the mental capabilities of a person. By testing and training the mental capabilities, the game refines the character of the person who plays chess on a regular basis. It is this special quality of the game of chess that made it withstand the travails of time and technology for the past 1500 years and still fascinates people. It is no doubt true that the game of chess will be there for many more centuries to come as long as this humankind, in its present form, exists in the world. Teaching chess to children and encouraging them to take up the game seriously is one of the best gifts that as parents and well-wishers we can give to our children. It is not an exaggeration, but a well-researched and proven fact. Students who were taught to play chess as part of their curriculum in their schools performed extraordinarily in comparison with other students who were not playing chess or not exposed to the game in their schools. By taking up chess as a sport or a favorite pastime in the young age and practicing the game frequently, children cultivate very good habits that will not only help them gain expertise in the game of chess, but also guide them for a better, brighter and prosperous life qualitatively. Children have the unique capability of learning things quickly and grasping them. Once a child is taught the basic elements of chess and encouraged to play the game, he or she will develop an interest for the game and try to go up the ladder of growth in chess. In his pursuit to learn more about the intricacies of the game, he will be anxious to read more about the grandmasters, the different types of games, tactics and strategies. This curiosity will lead him to read more books related to chess, and in the process, he, without his explicit knowledge, cultivate the habit of reading. One of the things a chess player should do while playing games is to note down the moves or record the notations, which will be useful for later analysis to find out the flaws or mistakes in the concluded game. Children playing chess will be interested in recording the notations. This exercise not only helps improve the understanding of the various squares, but also makes them write, which will ultimate improve their writing skills. In the game of chess, each of the pieces has a set value and identity relative to their capabilities and utility. The Queen is given 9 points, the rook gets 5 points, the bishop and the knight are assigned 3 points each and the pawns are given 1 point. Knowing the value of the pieces and their importance is very essential in the game of chess so that some sort of balance or equilibrium in terms of the pieces on the board is maintained. This analytical ability and assessment of values will be of much help to the people while they learn the skill of mathematics or such other analytical skills. Children learn the most important trait of decision-making skills right from the tender age as they gain expertise in the game of chess. Planning, analyzing, assessing different options, taking the right decisions and making the right moves are all developed as one plays the game of chess with passion and love. These virtues are very essential for success in life.